This website includes links to the sermons and other writings and talks by Robert Hamerton-Kelly. Please feel free to browse and read. Please properly attribute any re-publishing of this work. Robert Gerald Hamerton-Kelly was educated at the University of Cape Town and Rhodes University (BA, 1958) in South Africa, at Gonville and Caius College, Cambridge University in the UK (BA, 1961; MA 1966) and Union Theological Seminary, New York City (Th D 1966). He was a fellow of the Alexander von Humboldt Foundation at the University of Munster (Westfalen) in 1972 and at the University of Munich in 1977. He was an Assistant Professor of Religion at Scripps College in Claremont, California, (1966-70), an Associate Professor of the New Testament at Mc McCormick Theological Seminary, Chicago, (1970-72) and Dean of Chapel, Senior Minister of Memorial Church and Consulting Professor of Religious Studies and, by courtesy, Classics (1972-86) at Stanford University in California. He was also Senior Research Scholar in Ethics in the Center for International Security and Arms Control and the Institute for International Studies at Stanford (1986-1997). As Dean of Chapel and Consulting Professor he was a full member of the Stanford Faculty (Member of the Academic Council) and as a Research Scholar, a member of the Academic Staff. He lectured in Religious Studies, in the Greek section of Classics, and in the Ethics of International Security in general (Just War Theory and the proper use of military force) and the ethics of nuclear weapons in particular (Deterrence), in the department of Political Science: Program in International Relations. He retired early from Stanford in 1997 to become the Senior Minister of the Woodside Village Church in the vicinity of Stanford, and retired from there in 2004. Since retirement he continued to host a biweekly seminar at the university with René Girard on the theme of Religion and Violence, and to lecture and publish in that field. 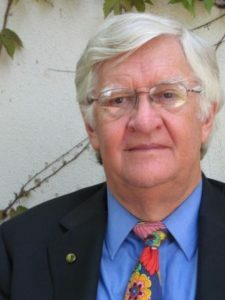 He was one of three founding members of the Colloquium on Violence and Religion, organized in 1990 and now a flourishing international scholarly group whose journal, Contagion, is a leading publication in the field. He was an ordained minister of the United Methodist Church, married to Rosemary Daly for 51 years, the father of three and the grandfather of seven. In retirement he served as the chaplain of the Palo Alto Society of St John the Evangelist, where he preached regularly and taught the Bible. As a fellow in the Center for International Security he participated at first hand in the activities arising out of the collapse of the Soviet empire and the realignment of Central Europe. He spent much time in Central Europe in the early nineties, and his last paper for the Center was on the religious component of the Balkan wars, presented in Graz, Austria, in 1997. He wrote extensively about the transition in Romania, with special reference to Transylvania and the Hungarian interests there. He was the author of six books and the editor of four. His first book was Pre-existence, Wisdom and the Son of Man (Cambridge University Press, 1973, republished 2004) and his latest book is Sacred Violence (Fortress Press, 1992). Since 1992 he has written articles on the political and cultural understanding of religion and its close relationship to violence. His edited volumes include Violent Origins: Walter Burkert, Rene Girard and Jonathan Z. Smith on Ritual Killing and Cultural Formation (Stanford University Press 1986), and Politics and Apocalypse: Studies on Carl Schmitt, Leo Strauss and Eric Voegelin in the light of René Girard’s Mimetic Theory (Michigan State University Press, 2007). Ten years of his sermons and papers are available on this website. The sermons show his abiding confidence in the Christian account of reality and are an integral part of his overall oeuvre. From 2007 to 2010, he served as President of Imitatio Inc., a foundation for supporting research concerning René Girard’s mimetic theory. In 2010, he moved to Portland, Oregon to be near two of his children and five of his grandchildren. He and Rosemary joined the First United Methodist Church of Portland where Robert joined the choir. In late June 2013, he suffered a stroke and passed quietly away on July 7, 2013 surrounded by his family. He is missed dearly by all. The Writings of Robert Hamerton-Kelly, Proudly powered by WordPress.